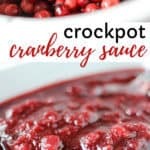 Homemade crockpot cranberry sauce made with fresh cranberries! The combination of orange juice, fresh cranberries, cinnamon and sugars create delicious flavors – and your house will smell amazing! 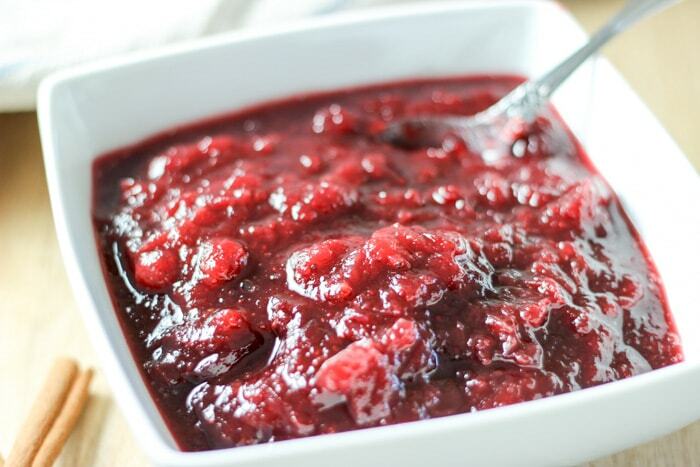 Cranberry sauce was not a part of our Thanksgiving growing up. In fact, I don’t think I’ve ever bought fresh cranberries. Sure, I’ve thought about stringing them by a fire at Christmas, but slow cooking them in a crockpot? Last year our church had our annual Thanksgiving meal together. I received the email with my instructions to make “cranberry sauce”. Do you just buy the can of the stuff? 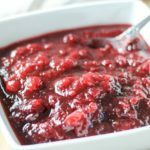 I decided to do a little digging and decided to make a fantastic Cranberry Sauce Slow Cooker Recipe. It was so easy to make and it looks just beautiful. 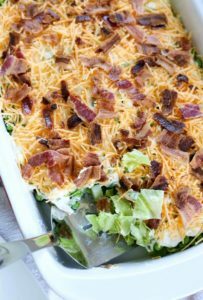 What I loved about this recipe is that I could make it with my kiddo. He helped me prepare it and then we turned on the crockpot. And the smell. 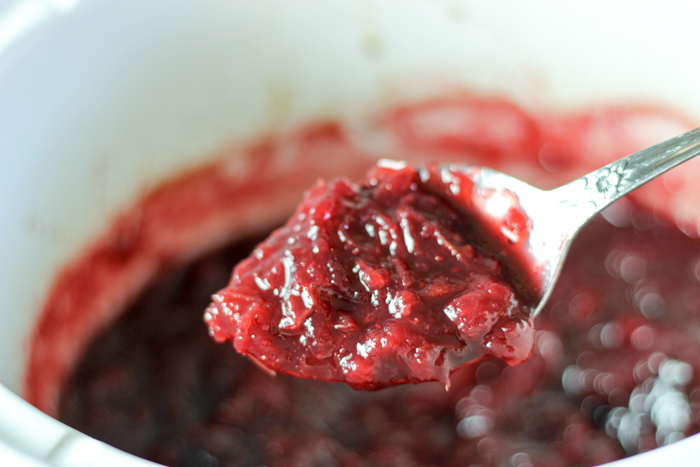 Who needs Yankee when you can make homemade cranberry sauce?! 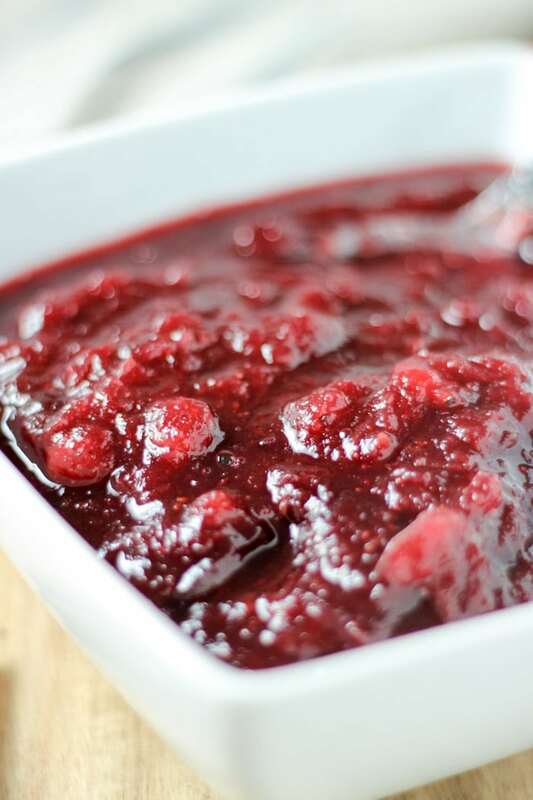 Combine all ingredients except for the cranberries in your slow cooker. 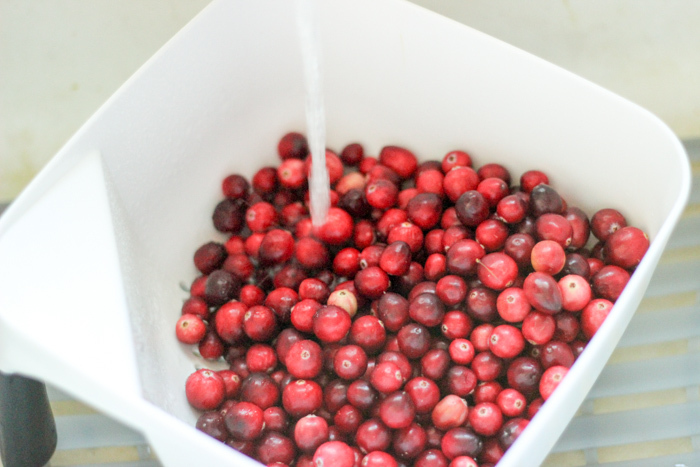 Rinse the cranberries with water. Let’s just talk about how pretty cranberries are. I mean, really. They are fun to photograph because of the rich red color. Add the cranberries to the crockpot and give it a good stir. Turn on high. Stir the sauce with the cranberries after one hour on high in the slow cooker and every hour after that until you get to three hours. Your house will smell amazing! The sauce will be thick and delicious. If you like your cranberries cooked down even more, you can leave them in the crockpot for longer, just keep an eye on them! 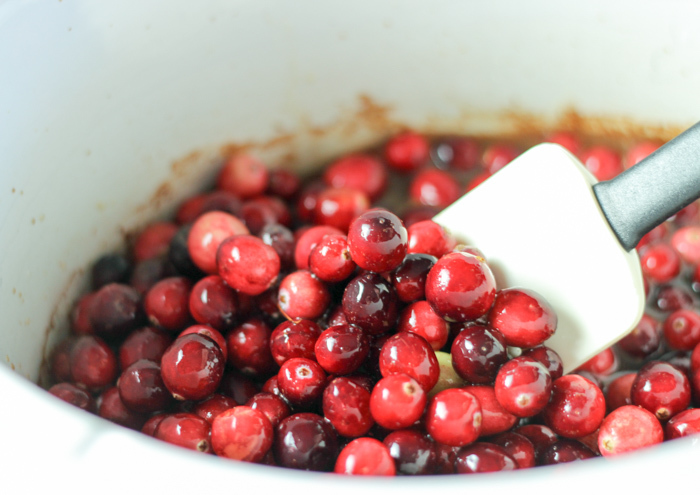 Can you make cranberry sauce ahead of time? 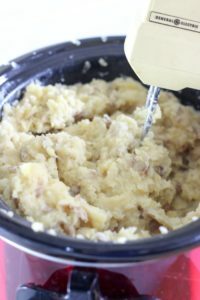 Here’s my FAVORITE crockpot I use all the time in my home! Purchase it HERE. 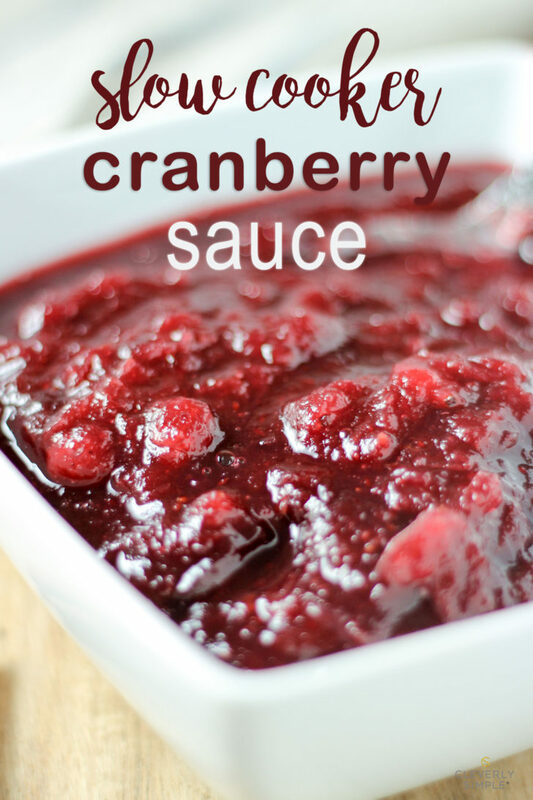 Homemade crockpot cranberry sauce combining orange juice, fresh cranberries, sugars and cinnamon. Combine all ingredients except the cranberries in the crockpot. Stir well. Add cranberries and evenly coat. Turn on the crockpot to high for 3 hours, stirring the cranberries every hour. After three hours on high, mash the cranberries. Continue to heat on high with the lid off, for 45 minutes. Let cool and transfer to serving dish. Make this the day before Thanksgiving. 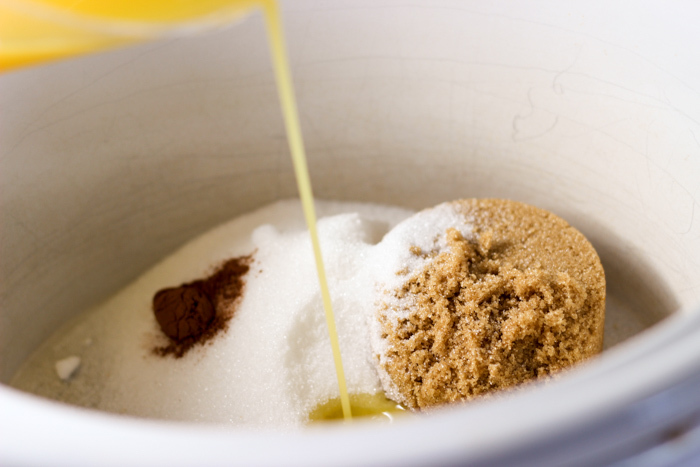 The house will smell amazing and you’ll have something finished! 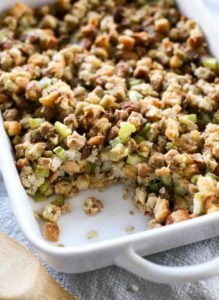 I plan on making this for Thanksgiving, but I know I will have extra. Is it possible to freeze this for later? 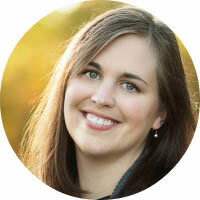 Hi Jen, I have never tried to freeze and reuse, but it’s always worth a try! Let me know how it goes. Hi. Just made this and I doubled the recipe. It turned out kinda runny. Will it thicken if I refrigerate it for tomorrow? Hi Rachel, You might have needed to double the cook time with the doubling of the recipe. 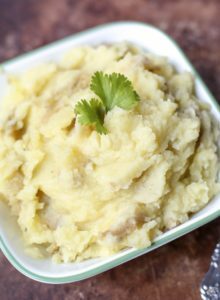 You can continue to cook it in the crockpot until it becomes the consistency you want. You can also try to put it on the stove top on low with no lid tomorrow and see if it will thicken up that way. This recipe is AMAZING! We’ve made it for three different family gatherings over the past year and are making it again tomorrow for this year’s Thanksgiving. Thank you so much for sharing it with the world! Making for our fest at school. 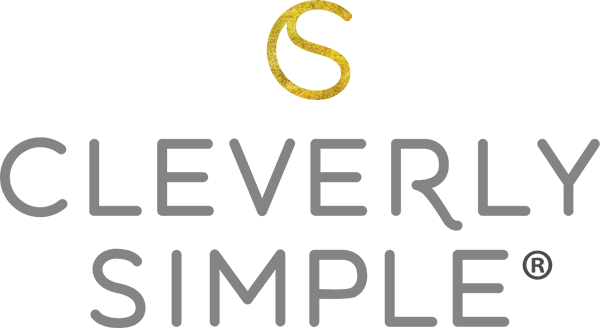 Can I use a small crock pot or does it have to be standard? Hi! I’m not sure what size you mean by small. However, any size that can fit all the ingredients will work.